On a damp, dark Saturday morning in November, a group of like-minded designers, developers, product managers, agile coaches, business analysts and project managers got up bright and early to meet at the Pivotal offices in London, UK for the Balanced Team London Salon 2015. After a hearty, cooked breakfast (thanks Pivotal!) we kicked off with a presentation from Johanna Kollmann on the history of Balanced Team. Then participants interviewed each other and introduced each other in the opening circle. As the Salon was an unconference, with the help of post-its and sharpies kindly provided by Unboxed, we then co-created our agenda for the day. We broke into discussion groups to share case studies and offer advice and support and share techniques and tips. The aim of the session is to encourage people to discuss their failures in a safe and supportive way, sharing only the lessons learned with those outside the room. It’s surprising how good it feels to stand up in front of a room of people, share your name and say you’ve failed and hear a deafening cheer in response! Several people volunteered to come to the front of the room and share their own failures and lessons learned. This was a great way to bring the group back together after lunch, and set the scene for the afternoon. A few people commented on how they were keen to try this game at work. I think many organisations could benefit from encouraging their employees and teams to celebrate and learn from “failures” in this mutually supportive way. “It was a tough start to a Saturday morning, waiting for a train down to London, shivering in the cold drizzle. In the end, I was really happy I went along to the Balanced Team Salon. Apart from the frankly top notch food and refreshments, and the good-sized location, I particularly appreciated the feeling of the whole event: egalitarian, focused, open, and supportive. I think everyone I talked to, from developers to product managers, event organisers, to other UX designers, wanted to find a way to share experience, so that we could all get better and doing what we do and working with other people. There was no preaching, no dogma; there were no role-related factions. Everyone pitched in, the format provided ample opportunity to focus on important things; new relationships were formed, and I think most people came away with a positive feeling, and having learned something. That was certainly my experience. 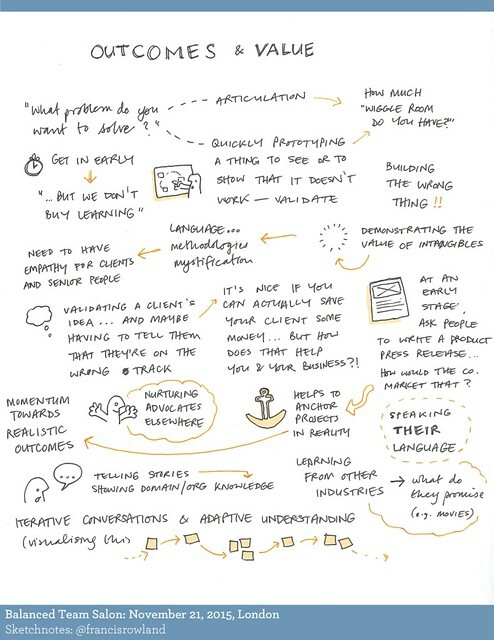 Francis also captured what he learned in his amazing sketchnotes. “I’ve been following the Balanced Team group for a while, but never participated in any of their events. I love the philosophy behind the group, and I admit I was a little worried that the audience would only be designers… But it wasn’t the case. Quite the contrary, actually: the audience of the event was diverse, only with the same interest in multidisciplinary teams that can actually deliver. The format is very simple: at the start of the day, people had explained what they were hoping to get out of the session, and it didn’t take long for many discussion topics to be generated. Somehow -don’t ask me how- I ended up facilitating a discussion around the role of a designer in an agile environment, and it was nice to see that other people struggled where I do. I learnt how to actually get people to share their failures (and learning) in a fun way. It’s common understanding now that failing isn’t an issue as long as we learn, but it’s still a bit taboo in some teams… the technique explained in this post will be great help! 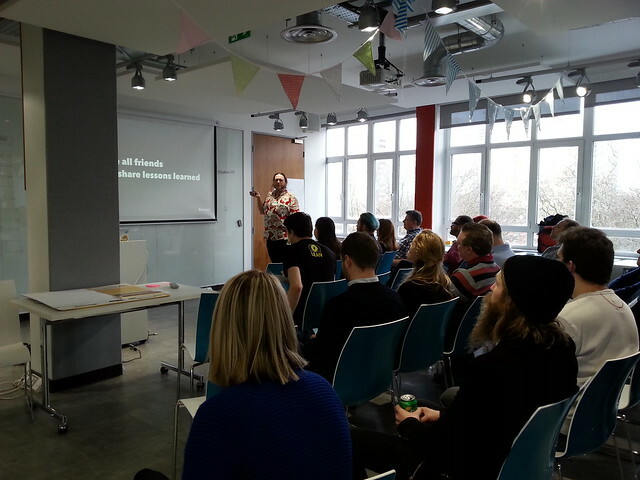 Compared to previous London events, we had more first-timers than existing Balanced Team members. This meant that fewer folks had prepared stories to tell or case studies to share. Lesson learned: reach out to previous attendees before the event and ask them to prepare/contribute/lead sessions (e.g. 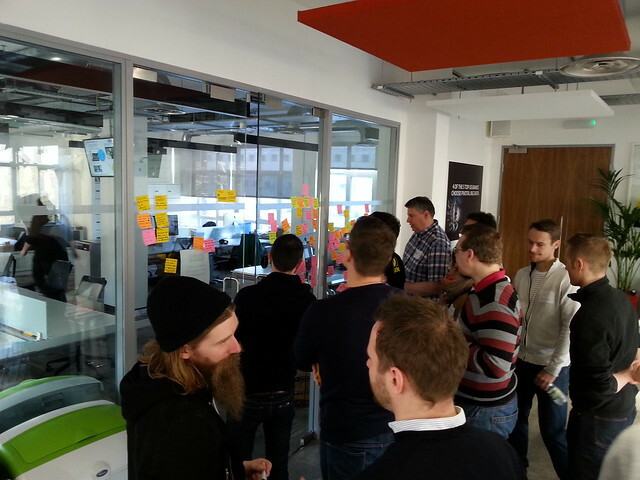 sharing a case study/story, lightning talk). Find space for smaller, break-out sessions and discussions. One open space worked for a small group in 2014, but did not work that well for our rather large group this year. 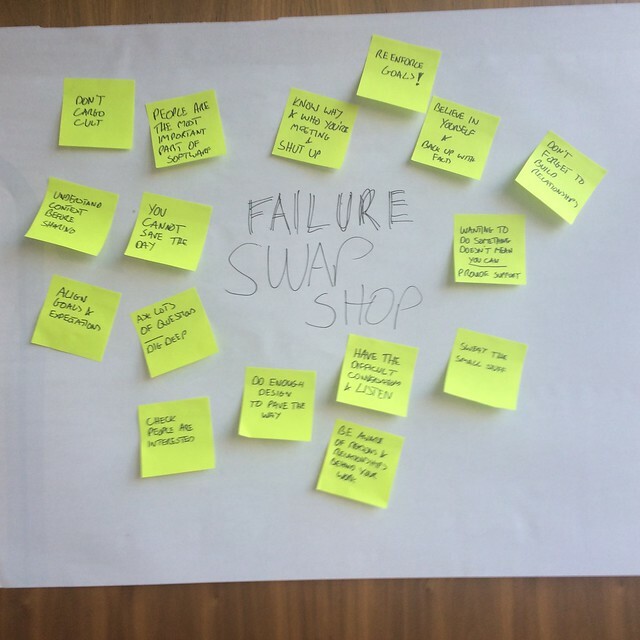 Organise an energising, facilitated post-lunch activity involving all participants – like Failure Swapshop. We put effort into inviting a mix of roles, to reflect the balanced team theme, and achieved diversity in attendees. We recommend to approach sending out invites to the event with this in mind. Actively seek participant feedback and re-plan throughout the day. A list of facilitation techniques would have been helpful to do this even better – something to prepare for next time. Finally, if you run a not-for-profit, volunteer event, what do you do with any leftover cash? Due to the kind sponsorship of Cultivate, Pivotal and Unboxed, after covering the evening drinks bills we still had enough money left over from the small event fee to donate 8 places to Crisis at Christmas. This may be a model other Balanced Team Salons could consider.